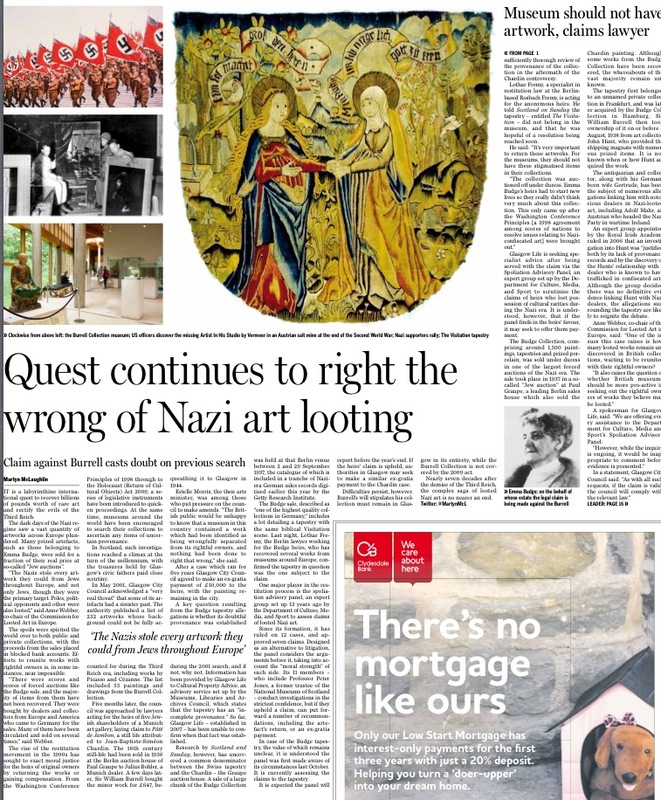 Nazi loot claim over Burrell tapestry from Scotland on Sunday and The Scotsman – A series of articles looking into the claims of Jewish heirs that the Burrell Collection owns a looted Nazi artefact. ONE OF Britain’s most est­eemed art collections is at the centre of an extraordinary legal wrangle with the heirs of a Jewish philanthropist whose multi-million pound treasure trove of artefacts was plundered by the Third Reich, Scotland on Sunday can reveal. The Burrell Collection has been served with a formal “spoliation” claim from lawyers acting on behalf of relatives of Emma Budge over a rare tapestry which has formed part of the ­Glasgow institution’s inventory for more than seven decades. In a potentially embarrassing case for Scotland’s largest local authority, the descendants of the German-American collector claim the 16th century Swiss artefact was sold off as part of a forced auction in the late 1930s. The German lawyer working for the heirs said it was “very important” to return the work, adding that museums should not have such “stigmatised” items in their collections. It comes seven years after Glasgow City Council made an ex-gratia payment to two Jewish families over a Jean-Simon Chardin painting in the Burrell Collection which had been sold 70 years previously to meet a wrongful Nazi tax demand. If upheld, the latest claim will prompt questions over whether the local authority, which owns the museum, and Glasgow Life, the arms-length organisation which manages it, carried out a sufficiently thorough review of the provenance of the collection in the aftermath of the Chardin controversy. Lothar Fremy, a specialist in restitution law at the Berlin-based Rosbach Fremy, is acting for the anonymous heirs. He told Scotland on Sunday the tapestry – entitled The Visitation – did not belong in the museum, and that he was hopeful of a resolution being reached soon. Glasgow Life is seeking specialist advice after being served with the claim via the Spoliation Advisory Panel, an expert group set up by the Department for Culture, Media, and Sport to scrutinise the claims of heirs who lost possession of cultural rarities during the Nazi era. It is understood, however, that if the panel finds in the heirs’ favour, it may seek to offer them payment. The Budge Collection, comprising around 1,500 paintings, tapestries and prized porcelain, was sold under duress in one of the largest forced auctions of the Nazi era. The sale took place in 1937 in a so-called “Jew auction” at Paul Graupe, a leading Berlin sales house which also sold the Chardin painting. Although some works from the Budge Collection have been recovered, the whereabouts of the vast majority remain unknown. The tapestry first belonged to an unnamed private collection in Frankfurt, and was later acquired by the Budge Collection in Hamburg. Sir William Burrell then took ownership of it on or before 8 August, 1938 from art collector John Hunt, who provided the shipping magnate with numerous prized items. It is not known when or how Hunt acquired the work. The antiquarian and collector, along with his German-born wife Gertrude, has been the subject of numerous allegations linking him with notorious dealers in Nazi-looted art, including Adolf Mahr, an Austrian who headed the Nazi Party in wartime Ireland. An expert group appointed by the Royal Irish Academy ruled in 2006 that an investigation into Hunt was “justified both by its lack of provenance records and by the discovery of the Hunts’ relationship with a dealer who is known to have trafficked in confiscated art”. Although the group decided there was no definitive evidence linking Hunt with Nazi dealers, the allegations surrounding the tapestry are likely to reignite the debate. IT IS a labyrinthine international quest to recover billions of pounds worth of rare art and rectify the evils of the Third Reich. The dark days of the Nazi regime saw a vast quantity of artworks across Europe plundered. Many prized artefacts, such as those belonging to Emma Budge, were sold for a fraction of their real price at so-called “Jew auctions”. “The Nazis stole every artwork they could from Jews throughout Europe, and not only Jews, though they were the primary target. Poles, political opponents and other were also looted,” said Anne Webber, co-chair of the Commission for Looted Art in Europe. The spoils were spirited the world over to both public and private collections, with the proceeds from the sales placed in blocked bank accounts. Efforts to reunite works with rightful owners is, in some instances, near impossible. “There were scores and scores of forced auctions like the Budge sale, and the majority of items from them have not been recovered. They were bought by dealers and collectors from Europe and America who came to Germany for the sales. Many of them have been circulated and sold on several times,” said Webber. The rise of the restitution movement in the 1990s has sought to exact moral justice for the heirs of original owners by returning the works or gaining compensation. From the Washington Conference Principles of 1998 through to the Holocaust (Return of Cultural Objects) Act 2009, a series of legislative instruments have been introduced to quicken proceedings. At the same time, museums around the world have been encouraged to search their collections to ascertain any items of uncertain provenance. In Scotland, such investigations reached a climax at the turn of the millennium, with the treasures held by Glasgow’s civic fathers paid close scrutiny. In May 2001, Glasgow City Council acknowledged a “very real threat” that some of its artefacts had a sinister past. The authority published a list of 232 artworks whose background could not be fully accounted for during the Third Reich era, including works by Picasso and Cézanne. The list included 55 paintings and drawings from the Burrell Collection. Five months later, the council was approached by lawyers acting for the heirs of five Jewish shareholders of a Munich art gallery, laying claim to Pâté de Jambon, a still life attributed to Jean-Baptiste-Siméon Chardin. The 18th century still-life had been sold in 1936 at the Berlin auction house of Paul Graupe to Julius Bohler, a Munich dealer. A few days later, Sir William Burrell bought the minor work for £647, bequeathing it to Glasgow in 1944. Estelle Morris, the then arts minister, was among those who put pressure on the council to make amends. “The British public would be unhappy to know that a museum in this country contained a work which had been identified as being wrongfully separated from its rightful owners, and nothing had been done to right that wrong,” she said. After a case which ran for five years Glasgow City Council agreed to make an ex-gratia payment of £10,000 to the heirs, with the painting remaining in the city. A key question resulting from the Budge tapestry allegations is whether its doubtful provenance was established during the 2001 search, and if not, why not. Information has been provided by Glasgow Life to Cultural Property Advice, an advisory service set up by the Museums, Libraries and Archives Council, which states that the tapestry has an “incomplete provenance.” So far, Glasgow Life – established in 2007 – has been unable to confirm when that fact was established. Research by Scotland and Sunday, however, has uncovered a common denominator between the Swiss tapestry and the Chardin – the Graupe auction house. A sale of a large chunk of the Budge Collection was held at that Berlin venue between 2 and 29 September 1937, the catalogue of which is included in a tranche of Nazi-era German sales records digitised earlier this year by the Getty Research Institute. The Budge sale, described as “one of the highest quality collections in Germany,” includes a lot detailing a tapestry with the same biblical Visitation scene. Last night, Lothar Fremy, the Berlin lawyer working for the Budge heirs, who has recovered several works from museums around Europe, confirmed the tapestry in question was the one subject to the claim. One major player in the restitution process is the spoliation advisory panel, an expert group set up 13 years ago by the Department of Culture, Media, and Sport to assess claims of looted Nazi art. Since its formation, it has ruled on 12 cases, and approved seven claims. Designed as an alternative to litigation, the panel considers the arguments before it, taking into account the “moral strength” of each side. Its 11 members – who include Professor Peter Jones, a former trustee of the National Museums of Scotland – conduct investigations in the strictest confidence, but if they uphold a claim, can put forward a number of recommendations, including the artefact’s return, or an ex-gratia payment. In case of the Budge tapestry, the value of which remains unclear, it is understood the panel was first made aware of its circumstances last October. It is currently assessing the claims to the tapestry. It is expected the panel will report before the year’s end. If the heirs’ claim is upheld, authorities in Glasgow may seek to make a similar ex-gratia payment to the Chardin case. Difficulties persist, however. Burrell’s will stipulates his collection must remain in Glasgow in its entirety, while the Burrell Collection is not covered by the 2009 act. Nearly seven decades after the demise of the Third Reich, the complex saga of looted Nazi art is no nearer an end. 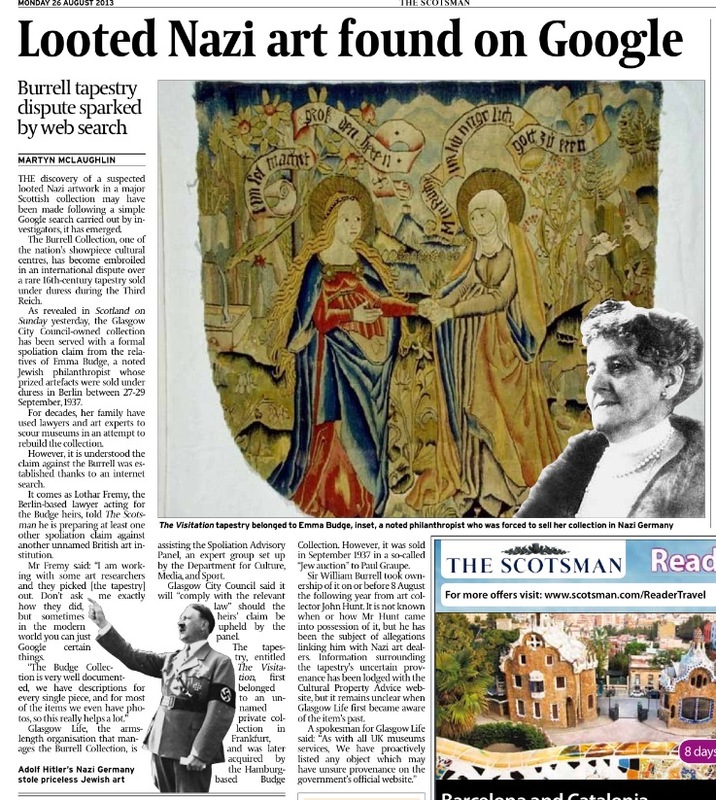 THE DISCOVERY of a suspected looted Nazi artwork in a major Scottish collection may have been made following a simple Google search carried out by investigators, it has emerged. The Burrell Collection, one of the nation’s showpiece cultural centres, has become embroiled in an international dispute over a rare 16th-century tapestry sold under duress during the Third Reich. As revealed in Scotland on Sunday yesterday, the Glasgow City Council-owned collection has been served with a formal spoliation claim from the relatives of Emma Budge, a noted Jewish philanthropist whose prized artefacts were sold under duress in Berlin between 27-29 September, 1937. For decades, her family have used lawyers and art experts to scour museums in an attempt to rebuild the collection. However, it is understood the claim against the Burrell was established thanks to an internet search. It comes as Lothar Fremy, the Berlin-based lawyer acting for the Budge heirs, told The Scotsman he is preparing at least one other spoliation claim against another unnamed British art institution. Mr Fremy said: “I am working with some art researchers and they picked [the tapestry] out. Don’t ask me exactly how they did, but sometimes in the modern world you can just Google certain things. Glasgow Life, the arms-length organisation that manages the Burrell Collection, is assisting the Spoliation Advisory Panel, an expert group set up by the Department for Culture, Media, and Sport. Glasgow City Council said it will “comply with the relevant law” should the heirs’ claim be upheld by the panel. Collection. However, it was sold in September 1937 in a so-called “Jew auction” to Paul Graupe. Sir William Burrell took ownership of it on or before 8 August the following year from art collector John Hunt. It is not known when or how Mr Hunt came into possession of it, but he has been the subject of allegations linking him with Nazi art dealers. Information surrounding the tapestry’s uncertain provenance has been lodged with the Cultural Property Advice website, but it remains unclear when Glasgow Life first became aware of the item’s past.